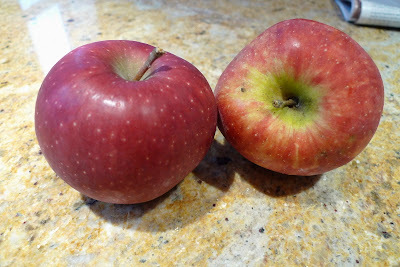 So a few weeks ago, Susan went apple picking with her nieces and nephews and brought back bags of delicious apples. Even though we were eating apples morning, noon and night, it was hard to eat them all so I was inspired to cook or bake with it and made some German Apple Pancakes. I think this recipe calls for making it in a cast iron skillet and finishing it off in the oven, but I had to leave my cast iron skillet behind in California so I cooked the apples separately and then used a baking dish for the actual pancakes. It still turned out heavenly so don't dismiss the recipe just because you can't follow the exact recipe. In a large bowl, blend eggs, flour, baking powder, sugar and salt. 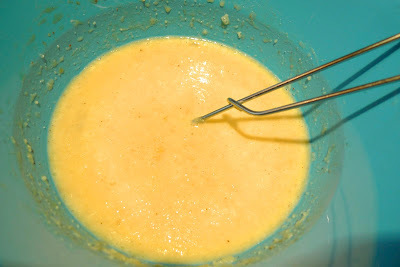 Gradually mix in milk, stirring constantly. 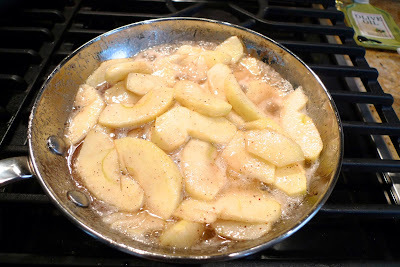 Add vanilla, melted butter and 1/2 teaspoon nutmeg. Let batter stand for 30 minutes or overnight. 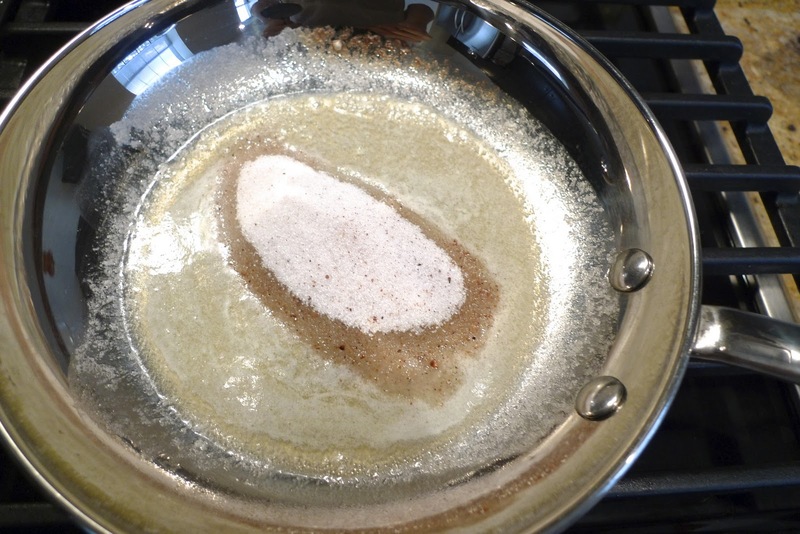 In a small bowl, combine 1/4 cup sugar, cinnamon and 1/2 teaspoon nutmeg. Sprinkle mixture over the butter. 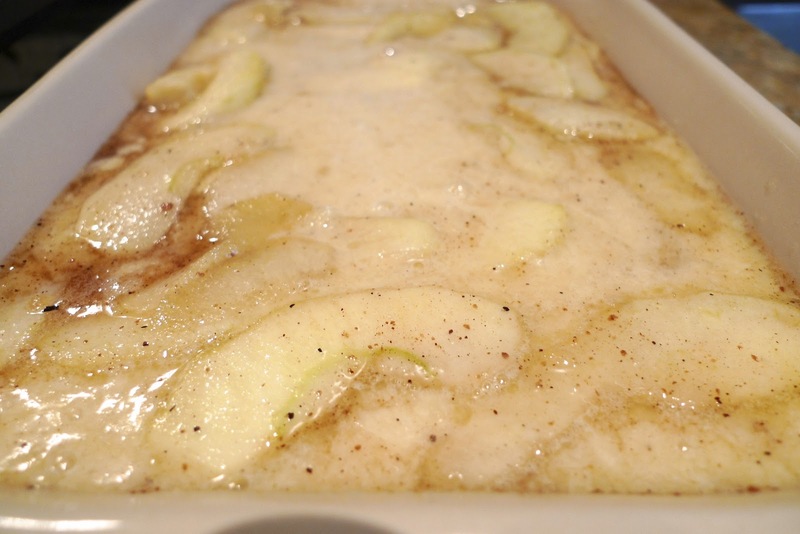 Line the pan with apple slices. 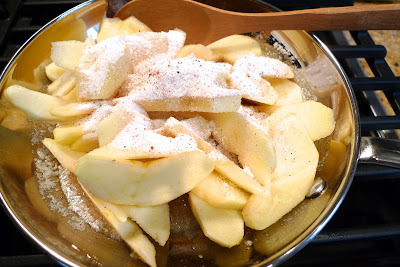 Sprinkle remaining sugar over apples. (I added the apples to the skillet and let it cook down a bit). Place pan over medium-high heat until the mixture bubbles. 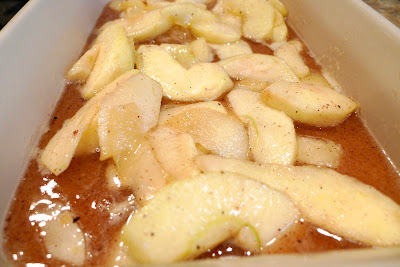 Look at my caramelized apples, don't they look good? 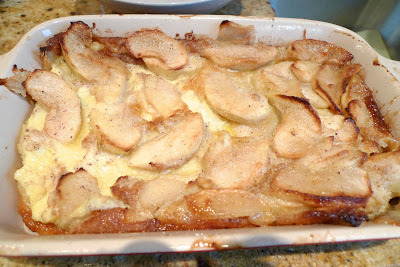 I transferred my apples to the casserole dish and poured the batter mixture over the apples. 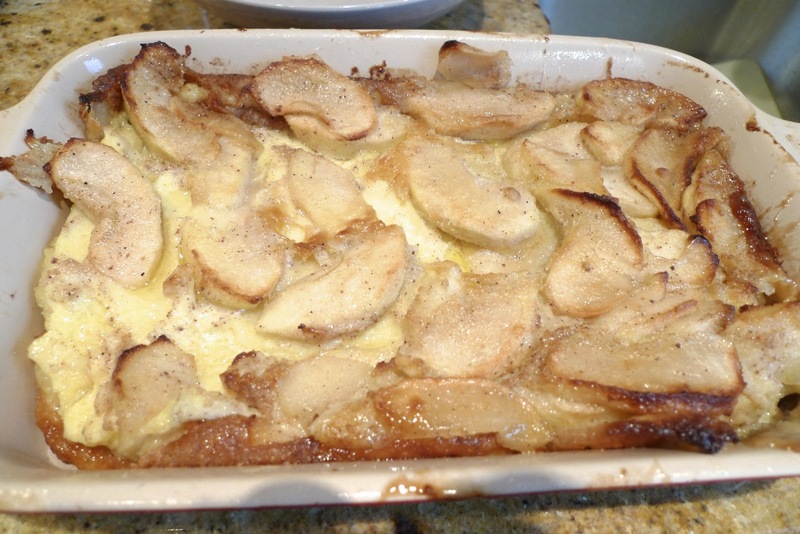 Once you pour in the batter, you'll see that the apples float up to the top. Don't fret, the final presentation will look great. Bake in preheated oven for 15 minutes. Reduce heat to 375 degrees F and bake for 10 minutes. It looked really puffy in the oven and I thought it might runneth over, but once you take it out of the oven, it deflates a bit. 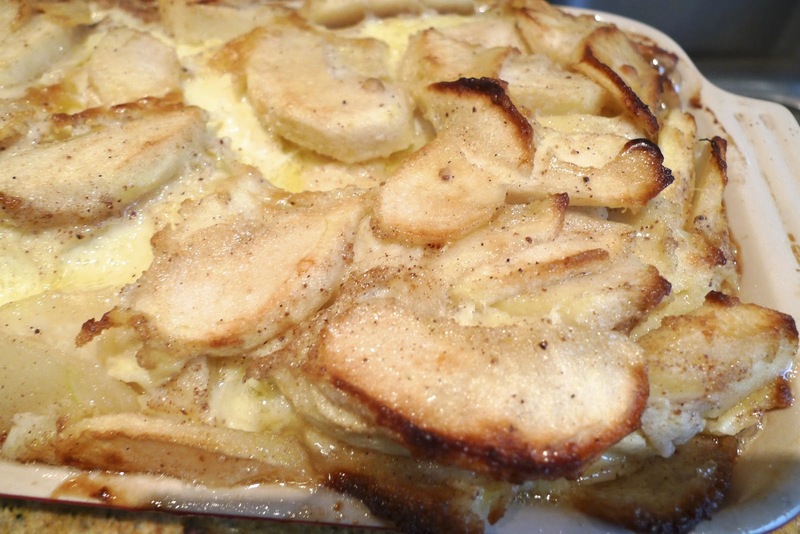 Slide pancake onto serving platter and cut into wedges. I cut myself a slice, poured on some maple syrup and had myself a lovely breakfast. This is actually a great recipe to make the night before if you are having guests over. 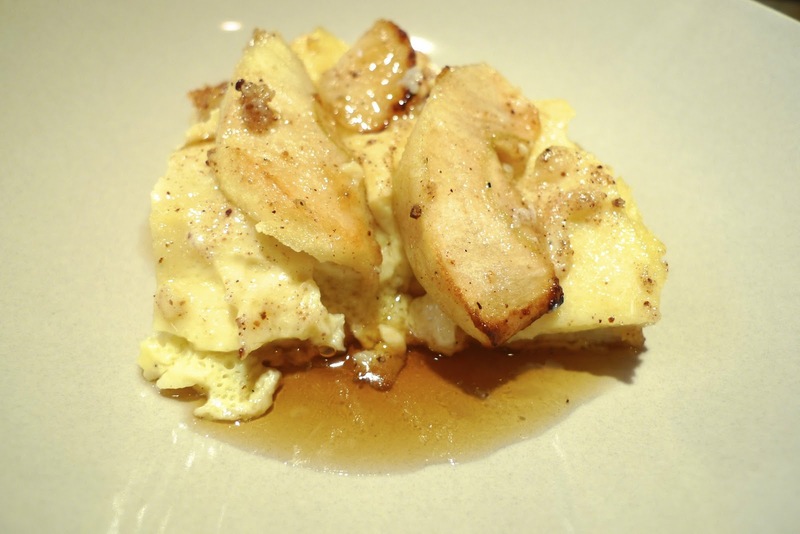 It makes for such a pretty presentation and it's light and fluffy, almost like you're eating an eggy custard. Anyone want to come over for brunch one of these days?